Modestino Fucci was born in Pietrelcina, Italy on April 17, 1917. The people of Pietrelcina were proud that their town was the birthplace of its most famous citizen, Padre Pio (Francesco Forgione). Modestino’s mother, Anna Fucci, loved to share her memories of growing up in Pietrelcina and having Francesco Forgione and his family for neighbors. Anna’s family home was very close to the Forgiones’ home. Also, in the countryside of Piana Romana, the two families owned land next to each other. Anna told and retold her stories of Francesco to Modestino and he never tired of hearing them. Modestino’s father also shared his own memories of Francesco on many occasions. Modestino’s mother, Anna, recalled that as a child, Francesco was quiet and also very devout. Anna described young Francesco as having an “exceptional reserve and a deep spirit of prayer.” She used to observe him as he walked passed her house and she noticed that he always carried a Rosary in his hand. He also spent a lot of time in church, either with his parents or with his grandmother. Anna often visited the Forgione family in their home. From time to time, she invited Francesco to play with her and the other children in the neighborhood, but he usually declined the invitation. By the time Anna got married and started raising a family, Francesco Forgione had been ordained to the priesthood and was known to everyone as Padre Pio. In Pietrelcina, Padre Pio was regarded by all as a holy priest. Sometimes when he passed by Anna’s house, she would ask him to take care of her little son Antonio and play with him while she took food out to the field workers on her land. Padre Pio would sit on a stone by the front door of Anna’s house and hold Antonio while she went about her duties. When Antonio grew up, his relatives told him how Padre Pio used to tend to him when he was a baby. Antonio’s esteem for Padre Pio was so great that he preserved the stone that Padre Pio used to sit on, considering it to be a relic. Whenever Padre Pio saw Anna, he would bring the subject up to her. The dialogue went on for months. “We must wait until my husband returns from his military duty,” was Anna’s reply. One day Padre Pio said to Anna, “Let’s baptize Incoronata tomorrow. Your husband will be returning tonight.” Anna was very doubtful about Padre Pio’s words, but to her great surprise, at midnight her husband returned home. The next day Padre Pio blessed and baptized the baby, offering his heartfelt prayers on her behalf. As it turned out, Incoronata’s life was filled with many graces. Later, when Anna heard the news that Padre Pio had received the stigmata, she said that she was not surprised. She explained that she had always known that Padre Pio was a saint. She had known it from the time that she and Padre Pio were children. The stories that Modestino heard from his mother and father through the years regarding their memories of Padre Pio, made a profound impression on him. His own vocation to religious life came about as a result. Angelo Caccavo, Modestino’s school teacher in Pietrelcina, also shared many interesting anecdotes about his “most famous” student, Padre Pio. After hearing so much about Padre Pio, Modestino had a great desire to meet him. Modestino was twenty-two years old when he met Padre Pio for the first time. The year was 1940. He traveled to San Giovanni Rotondo to ask Padre Pio for his blessing and his prayers as he had just been called up to serve in the Italian army. His mother, Anna, accompanied him to the monastery. Modestino and his mother were able to attend Padre Pio’s Mass. With deep emotion, Modestino watched the devout way Padre Pio celebrated Mass. It was the first time he had ever seen a priest shed tears during the Holy Sacrifice of the Mass. Modestino and his mother were also able to make their confession to Padre Pio. Making his confession to Padre Pio, marked a turning point in Modestino’s life and his love for prayer began to intensify. As time passed, he began to have a great desire to dedicate his life totally to God. For his military service, Modestino was assigned to the Ministry of War in Rome as a postman. His thoughts were constantly on Padre Pio. He often spoke of Padre Pio to the other enlisted men. One day, two officers told Modestino that they would like to meet Padre Pio. Modestino agreed to take both of the officers to San Giovanni Rotondo. One of the men worked at the Ministry of Agriculture and the other was a captain in the army. Modestino and the two officers were dressed in civilian clothing when they arrived at the monastery of Our Lady of Grace. They soon saw Padre Pio. Before Modestino could introduce his two friends, Padre Pio looked at the two men and said jokingly, “Oh, the poor army. Oh, the poor agriculture department!” They were amazed that he knew their military standing since they had never met him before. Modestino and his two companions fell to their knees and asked Padre Pio for a blessing. Padre Pio blessed the men and assured them of his protection. Afterward, the three men departed to return to Rome. Shortly before their arrival in Rome, the train that they were traveling in was bombarded. Every part of the train was destroyed except for the compartment that Modestino and the two officers occupied. They thought of Padre Pio and how he had said that he would protect them. During the time of his military service, Modestino spent his free time praying in the church of St. Francesca Romana in Rome. After much prayer and reflection, he felt that he had a calling to the religious life and he spoke about it to a priest, Father Placido Lugano. Father Lugano assured him that the Benedictines in Rome would be very happy to welcome him into their Order. Modestino wanted to join the Benedictines but before he made his final decision, he wanted to talk about it with Padre Pio. While on leave from military service, Modestino went to Pietrelcina to see his family. After being with his family, he made plans to visit Padre Pio. He did not have the money for transportation to San Giovanni Rotondo so he decided to walk the twenty-five mile distance. There were five other men from Pietrelcina who accompanied him on the journey. They were glad for the opportunity to visit Padre Pio. Along the way they experienced hunger, thirst, and great fatigue. They offered up all of the discomforts of their journey as a sacrifice to God. During the days of their visit, Padre Pio often spoke to Modestino and his friends in a small sitting room adjoining the little church of Our Lady of Grace. He spoke with great love about Jesus, the Blessed Virgin Mary, and the guardian angels. Modestino and his friends shared news with Padre Pio regarding their mutual acquaintances in Pietrelcina. During the visit, Modestino had intended to speak to Padre Pio about the calling he felt to join the Benedictines, but the right moment never presented itself. After a two week stay in San Giovanni Rotondo, when it was time for Modestino and his friends to make the journey back to Pietrelcina, they found it hard to say goodbye to Padre Pio. They also felt a certain dread, thinking of the hardships of the long walk home. Padre Pio noticed their hesitancy to leave and told them not worry about the return journey. “Divine Providence will come to your assistance,” Padre Pio said. That very day, Modestino and his friends learned that a car would soon be arriving from Pietrelcina. It was bringing the belongings of Padre Pio’s brother, Michael Forgione, who was moving to San Giovanni Rotondo. Arrangements were made so that the driver could take Modestino and his companions back to Pietrelcina the next day. That evening at the monastery, Tenino, the driver, developed a high fever. Modestino was with Padre Pio when the thought came into his mind that the return trip to Pietrelcina would be cancelled. 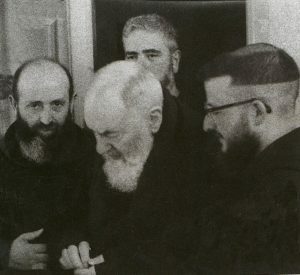 The moment that Modestino had the thought, Padre Pio turned to him and said, “You will definitely be going back to Pietrelcina tomorrow!” Padre Pio then asked Father Bernardo to take Tonino’s temperature for a second time. Father Bernardo did so and found that he still had a high fever. A short time later, Padre Pio shook the thermometer and took Tonino’s temperature himself. His fever had gone down significantly. Those who were present were amazed at the rapid improvement in Tonino’s condition. The next day, Tonino felt well enough to drive Modestino and the others back to Pietrelcina. In the summer of 1945, Modestino had the opportunity to spend one year living and working in San Giovanni Rotondo. He found board and room with a local family in exchange for his services to them. Every day, using a horse and carriage, he would transport the family members to their jobs and would pick them up again in the evening. During the day, he was free assist at Padre Pio’s Mass in the morning and to spend time with him each afternoon. Brother Modestino encountered many difficulties on his new job. Some of the members of the family that he worked for, tried his patience to the limit. One day he became so upset that he told the family he was quitting. He spoke to Padre Pio about it and asked him for advice. Padre Pio said to him, “Son, you know that I care about you. What you want from me, you will have!” Then he embraced Modestino in a loving and fatherly way. For a moment, Modestino rested his head on Padre Pio’s chest. Suddenly, he was able to let go of all the bitterness and resentment that had been festering in his heart. Modestino did not know what Padre Pio meant by the mysterious statement, but the words frightened him. He decided to reconsider his plan. He finally made the decision to become a Capuchin lay brother. When he went to the monastery and told Padre Pio the news, Padre Pio was deeply moved. In their great joy, they both wept. A few years later, Modestino learned the sad news that there was indeed a “great disaster” that occurred at the Benedictine monastery of Saint Francesca Romana in Rome. Robbers broke into the monastery and tragically, several of the friars were killed. Brother Modestino kept very busy with his assigned duties in Pietrelcina. One day, he visited his father who had just returned to Pietrelcina from San Giovanni Rotondo. His father, who was ill at the time, told Brother Modestino that before he left the monastery, he asked Padre Pio when he would see him again. Padre Pio told him that they would meet again in the next world. The remark was mysterious, to be sure. Brother Modestino wondered what Padre Pio’s words meant but he did not have to wait long to find out. The very next morning, his father had a stroke and passed away. In Pietrelcina, Brother Modestino was acquainted with a childhood friend of Padre Pio’s, Nicola La Banca. Nicola’s wife, Filomena once told Brother Modestino an interesting story about Padre Pio. Filomena had great faith in Padre Pio and on one occasion when Nicola was suffering from a terrible toothache, she advised him to pray to Padre Pio. Nicola was out of sorts due to the persistent pain and was in no mood to take advice from his wife. He became so irritated that he began cursing. He picked up a shoe and threw it against a picture of Padre Pio that hung on their wall. Years later, Nicola and Filomena traveled to San Giovanni Rotondo. Nicola was able to make his confession to Padre Pio. When he finished his confession, Padre Pio indicated that there was something else he needed to confess. Nicola did not understand. Padre Pio then reminded him of the incident long past. “Nicola, you threw a shoe at me with great force! Did you think I could feel the blow as far away as San Giovanni Rotondo?” Deeply embarrassed, Nicola could only respond, “I had a toothache.” “But why did you take it out on me?” Padre Pio asked. Another time, Brother Modestino was present when a man came to the confessional in a short-sleeved shirt. Padre Pio would not receive him. He told him to put on a long-sleeved shirt and then return and he would hear his confession. Brother Modestino made his confession to Padre Pio on many occasions. He always made an examination of conscience before entering theconfessional. He had a tendency to be overly scrupulous and often worried that he might have forgotten some of his sins that needed to be confessed. The thought of it caused him a great deal of torment. Brother Modestino decided to jot his sins down on a piece of paper. That way, when he was making his confession, if he forgot anything, he would simply look at his paper and it would be an instant reminder. Padre Pio was aware of Brother Modestino’s tendency toward scrupulosity and he wanted him to overcome it. In the confessional, when Brother Modestino reached in his pocket and pulled out the paper with his list of sins on it, Padre Pio became stern. “This is not a deed executed in front of a notary,” Padre Pio said. “Put that paper away now!” Brother Modestino did as he was told. Brother Modestino kneels in prayer in Padre Pio’s cell at the monastery of Our Lady of Grace. 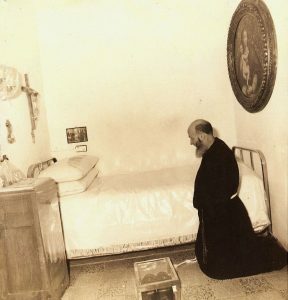 Brother Modestino visited Padre Pio in his cell on many occasions. Padre Pio’s cell was a reflection of true “Franciscan simplicity.” It contained just the bare essentials. He had an iron bed with a thin mattress. A small table in the room held his books and religious articles. A painting of Our Lady of Purity hung on the wall near his bed. Padre Pio’s cell had what Brother Modestino referred to as a “mystical silence.” Brother Modestino felt the presence of God whenever he entered Padre Pio’s cell. Not only was Padre Pio’s fragile health a source of continual suffering, there were also many other trials in his life that tested him to the limit. Once, Padre Pio confided to Brother Modestino how oppressive it was to have crowds of people pursuing him all the time. “Even someone who is in prison is given some time each day to have a few moments of privacy and freedom,” Padre Pio said. “But I am watched and followed all the time. I don’t have even a moment to myself!” Brother Modestino felt very sorry for him but there was nothing he could do. 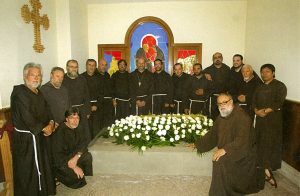 Brother Modestino’s esteem for Padre Pio continually increased with the passing of the years. Making his confession to Padre Pio and receiving spiritual direction from him was always a grace-filled experience. But it was by attending Padre Pio’s Mass that Brother Modestino came to realize the true greatness of Padre Pio and the power of his prayers. Padre Pio seemed to be restless when he entered the sacristy each morning. As he put on his priestly vestments in preparation for the Mass, he became completely unaware of what was going on around him. He did not want to talk. If anyone asked him a question or spoke to him for any reason, he would not respond. Padre Pio’s face was pale and sorrowful when he left the sacristy. When he got to the top of the steps and kissed the altar, the color came back into his cheeks. At the Confiteor of the Mass, when, in unison with the congregation, he asked for forgiveness for his sins, his eyes filled with tears. 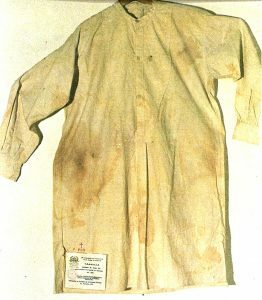 Padre Pio’s shirt with stains of blood from the stigmata. Brother Modestino knew that Padre Pio suffered, not only from the five wounds of the stigmata, but also from the crowning of thorns, the scourging, and the shoulder wound. In January 1945, Brother Modestino was the altar server at Padre Pio’s Mass. He was standing very close to Padre Pio at the altar when he noticed that little boils had appeared on his forehead, similar to thorn pricks. He saw Padre Pio touch his fingers to his forehead as though trying to remove something that was bothering him. Brother Modestino also saw a small cross in the center of Padre Pio’s forehead. Padre Pio died on September 23, 1968. As one devotee said, “God called Padre Pio at the end of an intense life and at the end of a hard day.” After Padre Pio’s death, the Capuchins felt that it was important to preserve his personal belongings for posterity. Brother Modestino was given the job of transferring Padre Pio’s priestly vestments, the sacred vessels he used at Mass, his clothing, and his personal possessions into special protective storage containers. Everything had to be identified, catalogued, numbered and dated. A declaration of authenticity was attached to each of the items. As Brother Modestino carried out the task, he saw with his own eyes, the marks of Christ’s Passion on many of the articles of Padre Pio’s clothing. He saw large bloodstains on Padre Pio’s white cotton socks. Five handkerchiefs that had belonged to Padre Pio were stained with tears and blood. Three of the handkerchiefs had been used by Padre Pio to wipe the perspiration from his brow. There were also numerous pieces of bloodstained linen cloth that Padre Pio had used to cover his heart wound. Brother Modestino discovered blood on Padre Pio’s woolen undershirt on the right shoulder area. He remembered that on one occasion when he and Padre Pio were talking, Padre Pio had confided to him how painful it was for him to change his clothes. Padre Pellegrino Funicelli once told Brother Modestino that on several occasions when he had helped Padre Pio change his woolen undershirt, he had seen a round bruise on his shoulder, sometimes on the left shoulder and sometimes on the right. It made Brother Modestino very sad to sort and inventory Padre Pio’s personal items. He often cried as he transferred Padre Pio’s clothing into the storage containers. One shirt in particular stood out among all the others for the large amount of blood. The shirt was made of linen and had long sleeves. It had been worn by Padre Pio on Good Friday in 1921. It was just three years earlier that Padre Pio had received the stigmata. It happened on the morning of September 20, 1918. The feast of the stigmatization of St. Francis had beencelebrated a few days before, on September 17. Padre Pio was all alone in the church of Our Lady of Grace on Friday, September 20. The superior, Padre Paolino of Casacalenda was out of town. Brother Nicola was also away that morning. All of the students of the Seraphic Boarding School were outside in the monastery courtyard for their period of recreation. As was his habit, Padre Pio had gone up to the choir loft to make his thanksgiving after Mass. In plain sight was the crucifix that was a permanent fixture in the church. It had been carved from cypress wood by an unknown 17th century sculptor. In a profound way, the sculptor had been able to capture the agony of the dying Christ. On that Friday morning, as Padre Pio prayed in the quiet church, he received the wounds of Christ. The next day, September 21, Padre Pio’s spiritual daughter, Nina Campanile spoke to Padre Pio in the sacristy of the church. She asked him to say a Mass for her sister, Vittoria, who was gravely ill. As she handed the Mass offering to him, she noticed what looked like a burn mark on the back of his hand. When she commented on it, he quickly hid his hand under his sleeve. The following day, Nina went to Father Paolino, the superior of the monastery, and told him that Padre Pio had received the stigmata. She explained to him that she had seen the marks on Padre Pio’s hand. Father Paolino was certain that Nina was mistaken. But some days later, he decided to find out for himself. One day, unannounced, Father Paolino visited Padre Pio in his cell. He took a close look at his hands and saw the wounds that Nina had described to him. Father Paolino did not question Padre Pio about it. Instead, he immediatelynotified the provincial, Father Benedetto, and asked him to come at once to the monastery. Father Benedetto instructed Father Paolino not to speak to anyone else about the marks of the stigmata that he had seen on Padre Pio’s hands. He did not want the information to be made public. Even Father Agostino Daniele, who had been close to Padre Pio for years, was not told about the matter. Father Paolino then spoke to Nina Campanile and stressed to her the importance of keeping the matter a strict secret. But Nina felt the need to tell her mother and sisters about the extraordinary incidence. Over the next several months, more people learned about it. People also noticed the open wounds on Padre Pio’s hands when he celebrated Mass. Gradually the news spread to the surrounding towns. Eventually the news spread to the whole world. I yielded to a drowsiness similar to a sweet sleep. All the internal and external senses and even the very faculties of my soul were immersed in indescribable stillness. Absolute silence surrounded and invaded me. I was suddenly filled with great peace and abandonment which effaced everything else . . . All of this happened in a flash. Padre Pio went on to say in the letter that he suddenly saw a mysterious “Exalted Being” whose appearance was similar to the personage who had pierced his side with a lance one month before, on August 5. The difference was that on September 20, the hands, feet, and side of the “Exalted Being” were dripping with blood. Looking at the mysterious person filled Padre Pio with terror and he believed that he was going to die. He felt sure that he would have died if the Lord had not come to his aide and strengthened him. The vision vanished and Padre Pio discovered that his own hands, feet, and side were dripping with blood. Later, Padre Pio’s longtime friend from Pietrelcina, Father Giuseppe (Peppino) Orlando, questioned him about the stigmatization. Padre Pio’s eyes filled with tears and his lips trembled when he spoke to Father Orlando about it. He said that on the morning of September 20, as he was praying in the choir loft, he saw a brilliant light. In the middle of the light appeared the wounded Christ. The wounded Christ was the same “mysterious Exalted Being” that he referred to in his letter to Father Benedetto. Christ did not speak to him. When the vision was over, Padre Pio found himself on the floor. His hands, feet, and side were bleeding. He was in so much pain that he did not have the strength to get up. Finally, and with great effort, he made his way slowly back to his cell. Once in his cell, he cleaned the blood from his wounds, changed his habit, and then, in his weakened state, laid down on his bed. 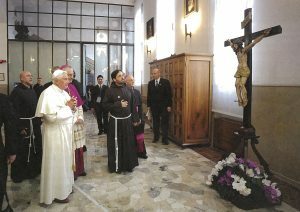 Pope Benedict XVI gazes at the wooden crucifix in the chapel of Our Lady of Grace in San Giovanni Rotondo. Padre Pio was praying in front of this crucifix when he received the wounds of Christ, the stigmata. Years later, another one of Padre Pio’s close friends, Father Raffaele of Sant’ Elia a Pianisi, had a conversation with him about the stigmata. Padre Pio told Father Raffaele that on September 20, the wooden crucifix that was in the monastery church was suddenly transformed into the living Christ. Rays of light and flames of fire then issued forth from the wounds in Christ’s body and pierced Padre Pio’s hands and feet. Because Padre Pio rarely ever spoke about the subject, the information he shared with Father Orlando and the additional details he told Father Raffaele are very valuable. Toward the end of Padre Pio’s life, the stigmata began to slowly disappear. On September 22, during Padre Pio’s last Mass, it was observed that the wound on his right hand had disappeared completely. However, there were still visible scabs on his left hand. Not only were his hands seen by the people who attended his Mass that morning, they were also captured on film. Dr. Francesco Lotti, the head pediatrician at the Home for the Relief of Suffering, had received permission to film Padre Pio’s Mass on September 22. He felt especially happy to receive the permission because his sons happened to be the altar servers for that Mass. No one suspected that it was to be Padre Pio’s last Mass. In the film, which is truly a gift to posterity, Padre Pio’s hands are clearly visible. Before the Mass was over, several of the scabs had fallen from his left hand. Dr. Giuseppe Sala, who was Padre Pio’s personal physician, was present at the time of Padre Pio’s death. There was still one scab on the palm of his left hand. Ten minutes after he died, there were no longer any signs of the stigmata. The skin on his hands, feet, and side, where the wounds had been, was now smooth and regenerated, uniform in color, and soft to the touch. There was no scarring whatsoever. Pray a great deal for me as I am living constantly on the Cross of the Lord, in the midst of those whom he has confided to me.